Forgive me this personal piece of writing about something that has nothing at all to do with me, personally. I am not impacted by, did not instigate, and have very little right or business writing about the Syrian war from a personal standpoint. Victims of war don’t have the choice to be impacted personally or impersonally, so the very provenance of this article feels self-indulgent, and I can’t decide whether it is actually just one inexcusably long (and hypocritical, as will come to light) Facebook status. However, there are two underlying points as to why this article exists: first off, I am at a loss as to how people are writing, or pretending to write, objectively about the issue at hand, and I wonder whether the aim (pretence) of being ‘objective’ – in other words, removing emotion and personability from opinion-forming and decision-making – is one of the main reasons why our country finds itself finally fully engaged in this war. Secondly, because I think there is something to say about the way the demographic I identify with (something along the lines of a set of young, liberal-ish, generally well-read, student/graduate first-time voters) has been engaging with the Syrian war – and that is through social media. There is, provisionally, nothing wrong with this. I would also argue we can’t help ourselves from stating, soundbiting and bolstering the readership and/or audience of snippeted news and culture that we relate to. Social media is a handy synthesis of all our favourite television and film, newspapers and magazines, people and public personalities – a personalised producer and platform of information unique to each person who logs in. It is also a great equalizer, which I am sure has had an impact on the current global discourses that insist on placing dual emphasis on Western and non-Western perspectives; that consider, for example, Beirut and Kenya alongside Paris. 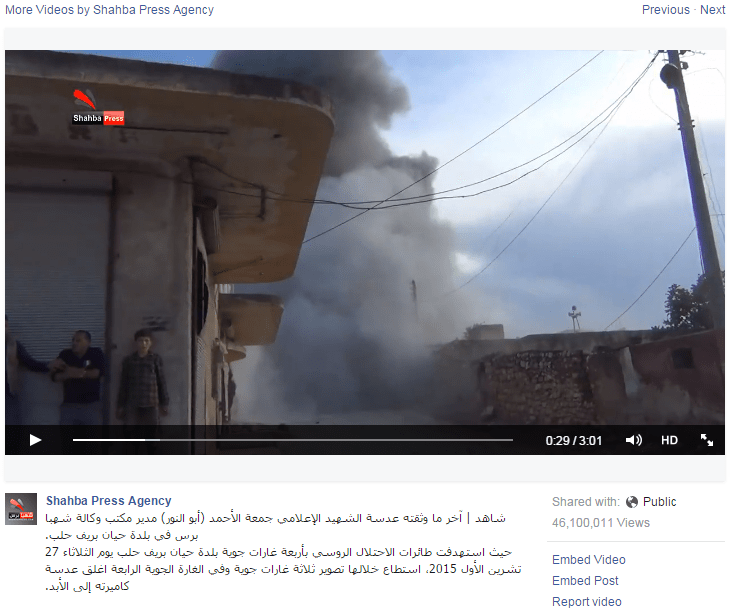 A friend of mine recently shared a video published on Facebook by the Shabha Press Agency. The text was in Arabic, and the only dialogue I could understand as I watched it was ‘Allahu Akbar,’ but the video stood alone. There is little a cleancut, English-speaking news reader or embedded journalist can add to footage of a family of young children falling out of the rubble of a house bombed seconds previously. It was filmed by an ordinary Syrian man on his phone. Some hours later, another friend shared the same footage, this time mediated by Channel 4’s Facebook page. The television channel had cut and edited the material with subtitles, and referred interchangeably to occupants of the town as ‘civilians’ and ‘rebels’ who ‘claimed’ the air strikes were by Russian drones. The town was described as ‘rebel-held’ whilst a man shouted (subtitled) emotionally at the camera that rebels had passed through four months ago and not returned. Both are harrowing and resourceful pieces of ‘news’ that most likely affect their viewers’ opinion of the Syrian war and potentially war in general – I know this only personally, as it affected mine. Fifty years ago, televised war did not exist. Ten years ago (comparisons to Iraq are inevitable) we would have watched a version of Channel 4’s presentation, and not the Shabha Press Agency’s. It’s possible the footage itself would not exist, courtesy of this ordinary man’s mobile phone and his upload to his own (personal) Facebook page; instead, the UK’s exposure to the war would be through some variation of a British gonso journalist with a camera, emailing his footage back to his corporate news agency as instructed. It is useful and eye-opening to have access to both. And yet – televised social media is its own minefield. We live in a sort of ‘clicking culture’ where to like or to share or to state in 140 characters or so seems to be a real political act. I wonder where interest/approval/outrage in our propensity to boost the readership and the audiences of certain footage, newspapers, parliamentary speeches, blog posts and televised debates ends – and where jumping on trends begins. I wonder whether my (Facebook) friends will think I don’t care about the victims of the Paris attacks for choosing (politically) not to tint my (personal) profile picture with the tricolor. I worry whether my friends will think I’m judging them (personally) if they did. I wonder, when we share, who we are sharing for. Who do we hope will see our posts? Do we aspire to change the minds of those who think differently? Do we compulsively place these links on our profiles to prove that we have an opinion at all? A couple of friends have mentioned recently that when someone announces a particularly oppositional – often, xenophobic or Islamophobic status – they remove that person as a friend/follower. I don’t remotely blame them. Then I wonder about the censorship of public (online) spaces, and then I wonder about our right to the personal-ness of our own profiles and the ‘social’ aspect of media in general. It’s quite rare that I come across a share that radically differs in extremes from my own viewpoints; after all, my own (personal) feed of information is tailored to me. Are we all preaching to the already-preached? Or are we offering up opinions into the empty air just to qualify that they’re there? That they exist like we exist? A friend recently went to Glasgow airport and applauded newly-arrived refugees. I learnt about this on Facebook. I have seen (and shared once) articles about groups of individuals who have set up collections points, hired vans and driven to Calais. Reflecting on this, I suppose I shared it in expression of my appreciation and wonderment. I didn’t then set up a collection point or drive to Calais. The most recent ‘terror threat’ in my hometown was a man with a machete in a tube station. A man rushed to try and stop him and was hurt; apparently most people there stood back to film the incident on their phones. My best friend is campaigning (albeit to her mum) to offer their house to a Syrian family. Meanwhile, we walk past homelessness on the streets and tell ourselves – perfectly reasonably – to choose our battles. It’s hard. We all know this, I think. I’m not trying to provoke or to patronise in writing this article, but to explore the relation we have to this extension of our personalities that is online, virtual space, when it is problematized by a polarising national and international current affair in which we are all complicit. I am complicit; I am an adult citizen, I voted in the general election that realised this government, I am six months away from paying taxes to it, and I am complicit in its regime unless I act definitively otherwise. It is unlikely this like or that share, here and there, will precipitate some sort of change, and the same probably goes for this article. I guess it’s a start – and that’s why I’ve decided (eventually) to publish this uber-long Facebook status, but, for me, there has to be more that comes from me, personally. I guess it is fairly obvious from this piece of writing that my own personal standpoint is anti-war, and there’s an anti-war protest in London this Saturday. Perhaps I’ll start, definitively, there. Hannah O is the Editor of FILM, THEATRE & TV at PTL. She really likes camera equipment, long words, and anything she can deep fat fry. Do not approach Hannah when she is eating fried food in the early hours; she will be drunk and convinced she knows everything. Elsewise, these days she may be found in Edinburgh University Library with her head in a book – probably Facebook. I read this article and found it very interesting, thought it might be something for you. 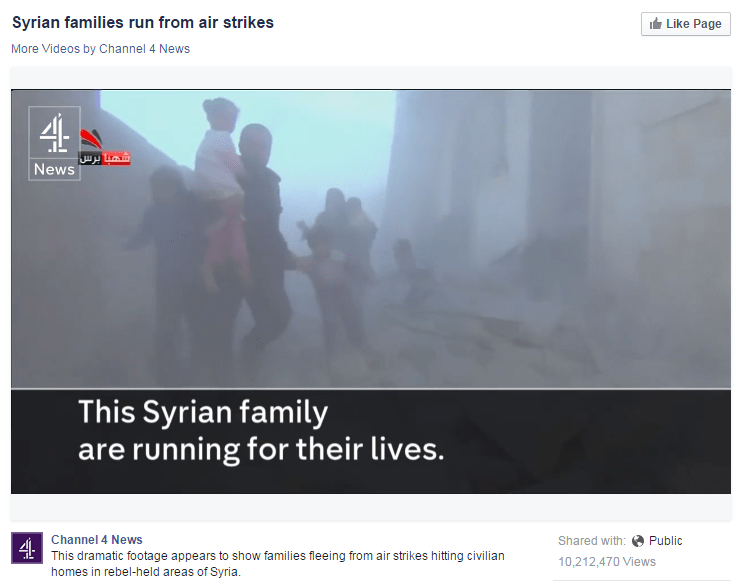 The article is called Syria in the Social Media Minefield and is located at https://prancingthroughlife.com/2015/12/10/syria-in-the-social-media-minefield/.